This is the most painful part in the whole process. 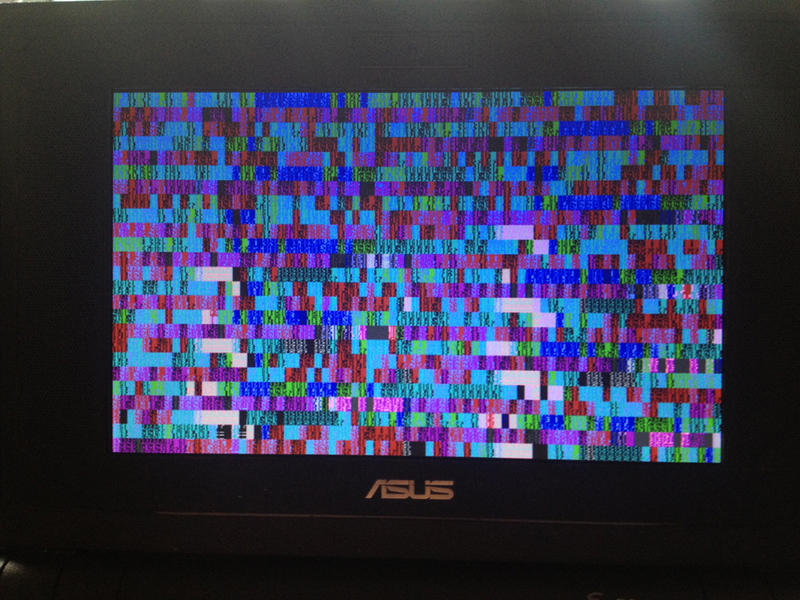 First make a bootdisk with MSDOS with Rufus. 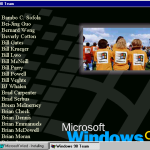 Add a copy of the Win98 folder from the 98 install disc, for the sake of booting and installing from it. Please note that Rufus installs a Windows Millenium DOS, so you better get an image of the Millenium boot floppy (for example from here) and grab Fdisk off it onto the USB. Get yourself a bootable flash with a partitioning tool. I recommend using Gparted. Once you’ve booted into it, go on and remove all of the stuff for the sake of creating a single 4GB partition on the SSD, and don’t forget to backup prior to that! Once you’re done with it, move on! Now enter DIR and make sure you see the files you had on your installation USB. Then enter cd Win98 (I blindly assume you didn’t rename anything you got from the CD, right?) and then setupcor /c /it /p a;b. This should start the setup process. If you use setup.exe, it will just stare at you with its deep black screen. The system will ask you some questions, and then proceed with the installation. If it decides to reboot on its own, point it to the installer media, not the SSD or the target disk! It doesn’t write any bootsector until it’s done doing stuff! By the way install it to D:\WINDOWS, because the C: drive is gonna be the installer flashdrive. You may try installing DOS and copying the Win98 folder onto the SSD, and starting the installation from there, but it didn’t work out for me. Right when it’s gonna detect devices it will ask you about every detection attempt. Always say “yes” so in case it hangs, you know where to substitute it for a “no” if it decides to hang on you. Alright, you got the thing running. 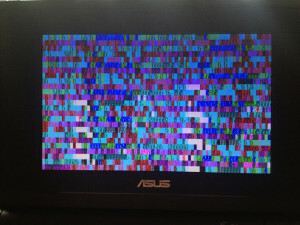 No sound, no network, and not even any decent resolution or color depth. And if you used the install-from-flash-onto-external-USB-disk method, no bootloader either (that’s why I recommend to use an SD as an installation media, I did it that way, and the SD is always here as the bootloader, and for the sake of keeping the installer handy). You’re so mad you even reboot your desktop Windows 7 computer by hitting the Reset button, but you did it. And all you got is this. Well maybe you installed Word and wrote a couple of docs, but still not satisfied. Well it means it’s time to get some drivers! The only ones I was able to find by now are video and USB ones. Sadly it seems that there are no Realtek HDAudio drivers, as well as no wireless ones, and even though it might be possible to get the Ethernet port to work using the Ndis drivers, it didn’t work out for me (if you know how to solve Ndis.vxd error code 2 – tell me in the comments), I had to make a special directory into which I had to expand all of the Driver*.cab files in order for Windows to at least let me install that. Maybe that’s just me, I’m not sure at all. Even though it works awesome when using Windows applications, in case you launch a DOS box with a program, fullscreen or whatever – it’s gonna screw stuff up with interesting textmode graphical effects. 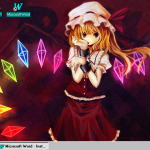 Sometimes hitting Alt+Enter to go fullscreen and again Alt+Enter to go back helps. Either you have the resolution or you have the colors – the driver cannot fit the whole image into the memory if you set 16bit at 800×600, except if you patch the BIOS, a way of what is something they forgot to tell us about, so you either have 640x480x32 (which is, to be honest, pretty usable, even x16 is fine for me), or 800x600x8, just 16 colors. Actually, I only got the 800×400 version to work, but in 16bit High Color, so it’s cool with me. However this doesn’t fix the ‘funky textmode’ problem at all. As for the USB support, the first thing to do is set the OS installation mode in BIOS to ‘Start’. Then install this USB driver carefully, paying attention to the instructions, and you’ll be good to go. And now it’s time for some screenies! It finally booted! And it works great! Checking out the themes available in Windows Plus! So for now I am getting on with it. 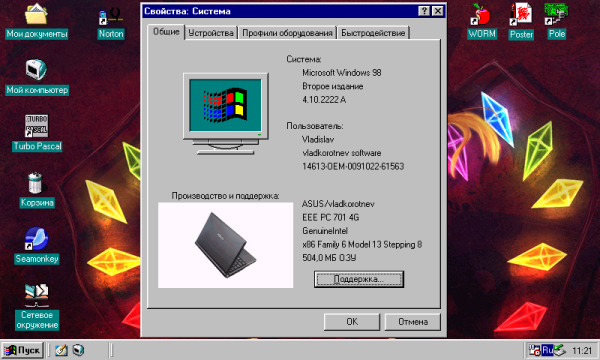 I can play the old games in DOS mode or Windows itself, even though without sound, most of those I liked didn’t have it anyway, and for music I have a portable CD player. 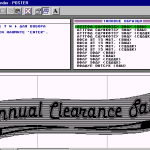 Word 97 is awesome in terms of the rare writing I do (like, for example, this article, written completely under Windows 98). 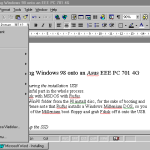 To summarize, let’s compare the pros and the cons of installing Win98 onto an EEE PC. It’s up to you whether to install it or not, but if you want to – it surely is an interesting time-travel adventure! Hey, where I can download this Theme “iMac”?